WASHINGTON — The Libyan leader Col. Muammar el-Qaddafi has “tens of billions” in cash secretly hidden away in Tripoli, allowing him to prolong his fight against rebel forces despite an international freeze on many of the Libyan government’s assets, according to American and other intelligence officials. Colonel Qaddafi has control over the huge cash deposits, which have been stored at the Libyan Central Bank and other banks around the Libyan capital in recent years, the officials said. The money — in Libyan dinars, United States dollars and possibly other foreign currencies — allows Colonel Qaddafi to pay his troops, African mercenaries and political supporters in the face of a determined uprising, said the intelligence officials, speaking on the condition of anonymity. The huge cash reserves have, at least temporarily, diminished the impact of economic sanctions on Colonel Qaddafi and his government. The possibility that he could resist the rebellion in his country for a sustained period could place greater pressure for action on the Obama administration and European leaders, who had hoped that the Libyan leader would be forced from power quickly. President Obama’s national security team met at the White House on Wednesday to discuss how to oust the Libyan leader, including the possible imposition of a no-flight zone, but made no decisions, according to the White House press secretary, Jay Carney. The United States has relied so far on imposing financial pain on the Qaddafi government, freezing nearly $32 billion of Libya’s assets, according to Treasury Department officials. The United Nations and the European Union have imposed separate sanctions and have frozen assets as well. But those actions have been limited to funds in the international banking system and to business investments outside of Libya. 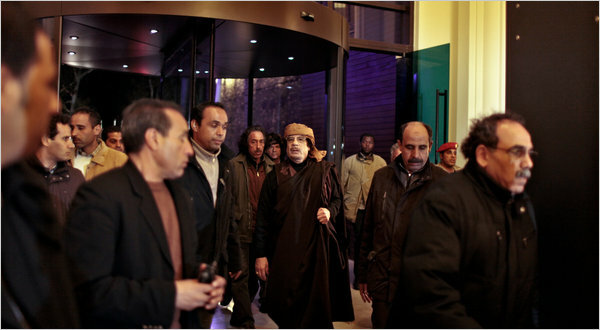 Inside the country, the intelligence officials said, Colonel Qaddafi has amassed a huge rainy day fund of cash. Kenneth Barden, a lawyer who specializes in Middle East financing and advises financial institutions on ways to guard against money laundering, said there were indications that Colonel Qaddafi had moved billions of dollars in assets just days or weeks before the outbreak of violence in Tripoli, apparently to protect his family wealth from global sanctions. But Colonel Qaddafi probably began hoarding liquid assets far earlier, officials said. He has built up Libya’s cash reserves in the years since the West began lifting economic sanctions on his government in 2004, following his decision to renounce unconventional weapons and cooperate with the United States in the fight against Al Qaeda. That led to a flood of Western investment in the Libyan oil and natural gas industries, and access to international oil and financial markets. Colonel Qaddafi, however, apparently feared that sanctions would someday be reimposed and secretly began setting aside cash in Tripoli that could not be seized by Western banks, according to the officials. He used the Libyan Central Bank, which he controls, and private banks in the city. He also directed that many government transactions, including some sales on the international oil spot market, be conducted in cash. “He learned to keep cash around,” said the person with ties to Libyan government officials, who asked to remain anonymous for fear of putting them in jeopardy. The reserves are likely to prove even more critical to Colonel Qaddafi as the government’s revenues dwindle from oil production. With the unrest, Libya is pumping just 300,000 to 400,000 barrels of oil a day, down sharply from its typical production of 1.8 million barrels a day, according to Holly Pattenden, head of oil and gas analysis at the Business Monitor International in London. The current levels would be worth about $30 million to $40 million a day, but export markets are now virtually closed to the country, as international banks refuse to provide letters of credit for oil company shipments, according to Greg Priddy, a global oil analyst with the Eurasia Group in Washington. “I don’t think they are deriving a lot of income from the export market right now,” Mr. Priddy said. “The international banks don’t want to touch it.” Still, several small Libyan refineries remain open, and Mr. Priddy said they were probably refining oil for the domestic market and fuel for Colonel Qaddafi’s military operations. With other sources of income drying up, the Libyan leader is heavily dependent on his pile of cash, and apparently spending it to stay in power. He is making cash payments to political supporters in Tripoli to retain their loyalty, while also buying the services of African mercenaries. The person close to the government estimated that 3,000 to 4,000 mercenaries from Mali, Niger and a rebel group operating in Darfur, Sudan, the Justice and Equality Movement, have been hired by the Libyan government for at least $1,000 a day apiece. United States intelligence officials said they could not confirm those numbers or amount of payments. Intelligence officials and other experts credit Colonel Qaddafi with becoming very adept at hiding his money, and said it had often been difficult to distinguish between the assets of the Libyan government, including its $70 billion sovereign wealth fund, and the Qaddafi family’s assets. Mr. Qaddafi’s history of financial dealings indicate that he has “surreptitious accounts and unaccounted sums that are significant enough to give him security even if the world caves in on him,” said David Aufhauser, a top Treasury Department official in President George W. Bush’s administration. Justice Department documents show that Libya had worked with Swiss banks to launder international banking transactions for years, with “hundreds” of senior Libyan officials allowed to surreptitiously move money. Tim Niblock, an expert on Libya and professor at the University of Exeter in Britain, said he believed that Colonel Qaddafi had hidden cash as far back as the 1990s. He said that it was part of a larger effort by the Libyan leader to protect his money from both the international community and his domestic foes. Helene Cooper contributed reporting from Washington, and David Rohde from New York. Barclay Walsh contributed research from Washington.